The snow globe measures 9cm high and is 29cm in diameter at the base. 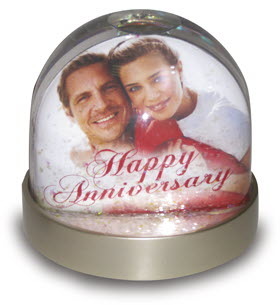 Simply upload your photo with your text (if required) and we will insert it into the snow globe for you. Personalise with your photos/images/artwork and/or text. Perfect unique gifts - especially for Christmas! Great for every occasion all year round Birthdays, Anniversaries, Engagements, Weddings....it's endless.